Our honeymoon suite features a variety of romantic room amenities to help celebrate your new life together as a married couple! Relax each night away in the bubbling Jacuzzi after spending an active day in Pigeon Forge and let the warm waters soothe your muscles. Watch a romantic movie together on the cable television as you cuddle together and kick back on the huge king sized bed. From seasonal gas fireplaces, mini refrigerators and other great amenities, we have everything you need to spend your honeymoon in style. It is no wonder why newly married couples choose Mountain Melodies as their ultimate honeymoon destination! 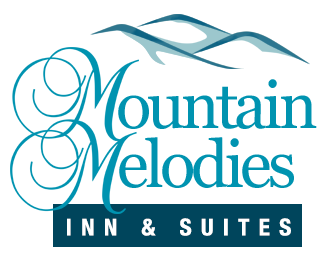 Another great reason to stay at Mountain Melodies for your honeymoon is our convenient access to all of the great area attractions, restaurants and shopping opportunities! Whether you are planning to explore Great Smoky Mountains National Park, spend the day shopping at the Island entertainment complex or see the top rated shows at Dollywood, our hotel is just minutes away! You will also appreciate the short drive to a wide variety of dining options where you can have a romantic dinner before returning to your comfortable honeymoon suite in Pigeon Forge TN. Couples on a honeymoon love starting each morning with our delicious complimentary breakfast before heading out for the day! This is a great way to save time in the morning without having to wait in long lines at local restaurants, not to mention the significant cost savings! This means that you can fill up every morning to your heart’s content and have plenty of energy for a full day of fun in Pigeon Forge. Take advantage of our breakfast dining area or take some food back to your suite to surprise your sweetheart with breakfast in bed! After months of planning your wedding, you may just want to relax on your honeymoon in Pigeon Forge! If that is the case, Mountain Melodies has just what you need to unwind with our refreshing outdoor pool and hot tub! Kick back on a lounger under the warm summer sun or swim a few laps in the pool to cool off on a hot day. Dip into the hot tub to sit back among the beautiful surroundings of the Great Smoky Mountains while you reflect back on your beautiful wedding and this unique time spent together. Check out our honeymoon suite in Pigeon Forge TN and other great rooms today to plan your honeymoon to the Great Smoky Mountains! We look forward to welcoming you as a newly married couple to Mountain Melodies!